“There is the 28- to 34-year-old pro who’s basically finally gotten to the level they could hope to get to and… with the exception of Louie Barletta, who I think went pro pretty late and still was able to have a pretty long career and then segue into the in-house kind of stuff… it’s so gnarly because you spend so much of your life getting so good at this useless skill, and then you get a small amount of recognition, a small amount of money considering average salaries for that age, and then you’re sort of let loose into the world. It’s so brutal.” Co-podcaster Ryan Lay puts in that he didn’t earn a livable wage from skateboarding until he was 27 or 28. The concept of an economic widening among the professional rankings is not new; in particular, eastern-coaster pros have aired warnings for the better part of a decade, and evidence has emerged in video parts. But now, as we gird ourselves for the looming ’20s, for the first time in history, is it better to be a ‘fan of’ skateboarding than a professional or pro-track amateaure? In those heady summers of the late 1970s and early 1980s, pro wages escalated and dove in accordance with contest supremacy and industry largesse. But for all others, skateparks remained far between, magazines relatively few, and televised video a luxury afforded strictly to The Fall Guy, certain copyrighted muppets, and JR Ewing’s oily asset base. By the time Jake Phelps declared skateboarding ‘dead’ in the early 1990s, it had gone thoroughly underground, draping itself in flappy t-shirts and brightly colored pants that served to mark pros and ‘joes’ as near-equals in the same downtrodden outcast tribe, separated only by their boards’ successful flip totals. Later, Tony Hawk and Wet Willy and Mountain Dew developed lucrative franchises that liberally showered American currency over pro and am ranks alike for several generations, until the Great Recession forced a harsh fiscal reckoning and Internet proliferation helped fuel a long-gestating fragmentation that has scooped out skateboarding’s middle, with some casualties. For the hardgood/content/Culture consumer, meanwhile, the great internet blow-out has opened up a bottomless cornucopia serving any and every potential niche imaginable. Underserved and underrepresented groups can link and expand without need for sponsorship or co-signs from powers that be; prehistoric, pleistocene and popsicle deck options all are freely available; a bunch of European kids can make a Barcelona-heavy video heavy on circus tricks (by the ‘Trilogy’/’Mouse’ benchmark) and make it one of the year’s top videos; the Es Scheme has returned to the public marketplace, not that anybody necessarily asked. Kerry Getz, whom video footage previously has shown to be sensitive to stress, may represent an early indicator of what researchers have identified as ‘choice overload’ — pressure from having to choose among a steadily broadening set of options. Northwestern University researchers have found persuasive evidence of such stressors afflicting the U.S. consumer class, which can leave unprepared spenders feeling dissatisfied with their ultimate choices, fearful to choose in the first place, or refusing to make any decision at all. Perhaps the most historic and extreme example showing the possible downside of such choice overload is that of Ghengis Khan, well-known leader of the Mongol horde, rugged individualist, and eventual emperor over most of modern-day Asia and Europe. Ghengis Khan, perhaps more so than any other empire-builder, contemplated a near-global range of options when mulling that central question: What to have for lunch to-day? 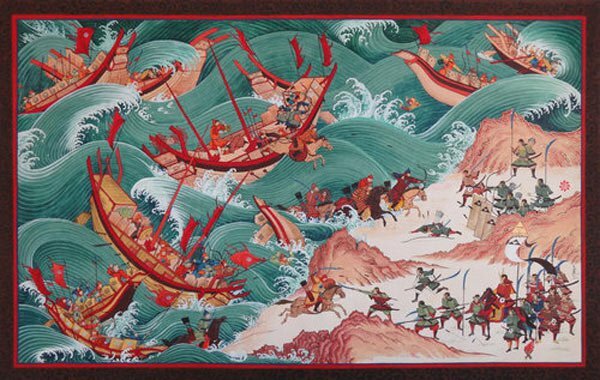 At its peak, the Mongol empire touched cuisine options ranging from Korean BBQ and Russian borscht to lo mein noodles and various forms of goulash. And yet, according to ‘The Secret History of the Mongols,’ the great and terrible khan’s death came while, apparently unsatisfied with any of these myriad possibilities, he went hunting. Can the untimely death of Ghenghis Khan some 800 years ago teach skateboarders important lessons about using and abusing Instagram and streaming video before it’s ‘too late’? Is Sour’s release of a second bananas video only about six weeks after their last one a ‘bridge too far’ or merely an outtakes-fueled flex? Did you know you can again buy clay wheels? Is everybody gonna die? This entry was posted on April 7, 2019 at 1:00 pm and is filed under Uncategorized. You can follow any responses to this entry through the RSS 2.0 feed. You can leave a response, or trackback from your own site.